Twelve-year-old Rory and her little sister, Violet are, at least, living together in the Catholic Foundling Hospital in New York City. But in 1904 the hospital begins to send orphans to the Arizona Territory to be adopted by devout Catholic families. Too old to be adopted, Rory is desperate to find a way to accompany Violet. With no other recourse, she stows away on the “orphan” train determined to make sure the family who adopts Violet is a good one. But Rory soon discovers that the families the Sisters have chosen for the white orphans are actually Mexican immigrant families, which deeply offends the local Anglo community. The trouble that ensues is much more complicated and dangerous than anything the resourceful Rory had bargained for. But seeking justice and finding the right family for them both is what helps her persevere. Based on actual events, this is the first book in a character-driven three-book series that examines little-known moments in American history. Includes an author’s note and bibliography. 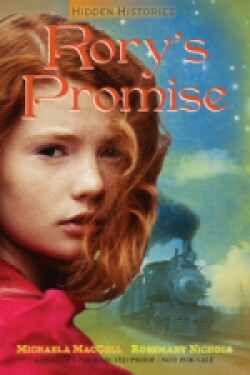 "Rory's Promise is a thrilling and moving journey through a fascinating chapter in our history." "An incredible story based on a real happening, well told by a wonderful writer. I couldn't put it down!" Check out the trailer for my latest release -- Rory's Promise. It's a novel about the orphan trains and one girl's struggle to make a family for herself.